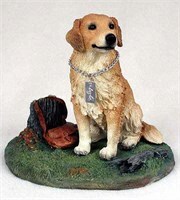 Nothing beats the exceptional look and quality of our Golden Retriever Figurine. Among the finest made, you will be provided with great satisfaction and long lasting enjoyment. Why not pamper yourself or give a loved one a Golden Retriever gift to show them how much you care. The Golden Retriever Figurine will make the perfect gift for any Golden Retriever lover. Shop with confidence, because all products come with a 100% customer satisfaction guarantee. Click over now to see the big selection of Golden Retriever gifts we offer. You will love the fine detail and clever way this Golden Retriever Figurine MyDog captures all the best features and spirit of your favorite friend. 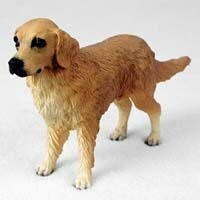 Our Golden Retriever Figurine MyDog will look great displayed on your desk at work or on a mantel at home. Perch this tiny statue next to a framed photo and you?ÇÖll have an instant focal point in your living room. 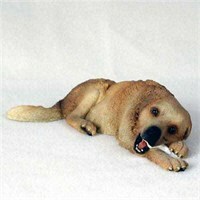 Our delightful Golden Retriever Figurine MyDog are made of stone resin and are hand painted to feature exceptional detail. This fine Collectible measures 4-5 inches in size. You will love the fine detail and clever way this Golden Retriever Figurine MyDog-Stump captures all the best features and spirit of your favorite friend. 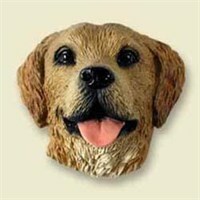 Our Golden Retriever Figurine MyDog-Stump will look great displayed on your desk at work or on a mantel at home. Perch this tiny statue next to a framed photo and you?ÇÖll have an instant focal point in your living room. Our delightful Golden Retriever Figurine MyDog-Stump are made of stone resin and are hand painted to feature exceptional detail. This fine Collectible measures 4-5 inches in size. Nothing beats the exceptional look and quality of our Golden Retriever Floormat. Among the finest made, you will be provided with great satisfaction and long lasting enjoyment. Why not pamper yourself or give a loved one a Golden Retriever gift to show them how much you care. The Golden Retriever Floormat will make the perfect gift for any Golden Retriever lover. Shop with confidence, because all products come with a 100% customer satisfaction guarantee. Click over now to see the big selection of Golden Retriever gifts we offer. A mischievous Golden Retriever Golf Headcover may be the perfect item to keep your golf game out of the surrounding trees. The soft yet durable Golden Retriever Golf Headcover fits up to 460cc driver as well as your fairway wood, and the faux sheepskin lining is twice the thickness found in other brands. Guaranteed for life, your UV-resistant Golf Headcover deters theft by concealing your valuable clubs. The featured creature can represent a game that may not be beautiful, but has authority and direction. 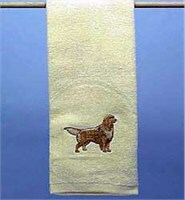 Nothing beats the exceptional look and quality of our Golden Retriever Hand Towel. Among the finest made, you will be provided with great satisfaction and long lasting enjoyment. Why not pamper yourself or give a loved one a Golden Retriever gift to show them how much you care. The Golden Retriever Hand Towel will make the perfect gift for any Golden Retriever lover. Shop with confidence, because all products come with a 100% customer satisfaction guarantee. Click over now to see the big selection of Golden Retriever gifts we offer. Nothing beats the exceptional look and quality of our Golden Retriever Cap. Among the finest made, you will be provided with great satisfaction and long lasting enjoyment. Why not pamper yourself or give a loved one a Golden Retriever gift to show them how much you care. 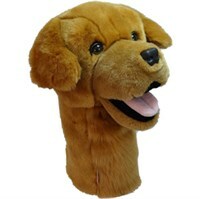 The Golden Retriever Cap will make the perfect gift for any Golden Retriever lover. Shop with confidence, because all products come with a 100% customer satisfaction guarantee. Click over now to see the big selection of Golden Retriever gifts we offer. 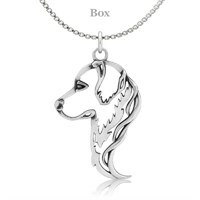 Our Sterling Silver Golden Retriever Head Necklace are hand made and made of .925 Sterling Silver. 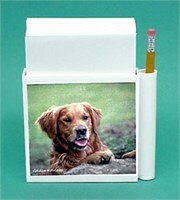 Nothing beats the exceptional look and quality of our Golden Retriever Hold-a-Note. Among the finest made, you will be provided with great satisfaction and long lasting enjoyment. Why not pamper yourself or give a loved one a Golden Retriever gift to show them how much you care. The Golden Retriever Hold-a-Note will make the perfect gift for any Golden Retriever lover. Shop with confidence, because all products come with a 100% customer satisfaction guarantee. Click over now to see the big selection of Golden Retriever gifts we offer. 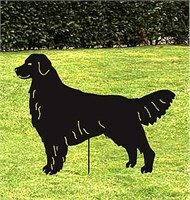 Think outside of the box and create a real sensation with your exceptional Golden Retriever House Flag. This tough Flag is a large 28 x 40 inches with an eye catching double sided image tailor made to withstand any storm. A 2 year no fade or rip guarantee comes with this canine champion that you will be proud to display or give as a cool gift this year. Take the style prize in your neighborhood with the Golden Retriever House Flag right away. 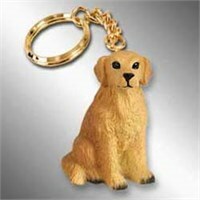 Nothing beats the exceptional look and quality of our Golden Retriever Keychain. Among the finest made, you will be provided with great satisfaction and long lasting enjoyment. Why not pamper yourself or give a loved one a Golden Retriever gift to show them how much you care. 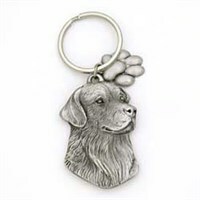 The Golden Retriever Keychain will make the perfect gift for any Golden Retriever lover. Shop with confidence, because all products come with a 100% customer satisfaction guarantee. Click over now to see the big selection of Golden Retriever gifts we offer. Nothing beats the exceptional look and quality of our Golden Retriever License Plate Frame. Among the finest made, you will be provided with great satisfaction and long lasting enjoyment. Why not pamper yourself or give a loved one a Golden Retriever gift to show them how much you care. The Golden Retriever License Plate Frame will make the perfect gift for any Golden Retriever lover. Shop with confidence, because all products come with a 100% customer satisfaction guarantee. Click over now to see the big selection of Golden Retriever gifts we offer. 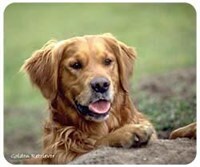 Nothing beats the exceptional look and quality of our Golden Retriever Magnet. Among the finest made, you will be provided with great satisfaction and long lasting enjoyment. Why not pamper yourself or give a loved one a Golden Retriever gift to show them how much you care. The Golden Retriever Magnet will make the perfect gift for any Golden Retriever lover. Shop with confidence, because all products come with a 100% customer satisfaction guarantee. Click over now to see the big selection of Golden Retriever gifts we offer. Nothing beats the exceptional look and quality of our Golden Retriever Mousepad. Among the finest made, you will be provided with great satisfaction and long lasting enjoyment. Why not pamper yourself or give a loved one a Golden Retriever gift to show them how much you care. The Golden Retriever Mousepad will make the perfect gift for any Golden Retriever lover. Shop with confidence, because all products come with a 100% customer satisfaction guarantee. Click over now to see the big selection of Golden Retriever gifts we offer. Nothing beats the exceptional look and quality of our Golden Retriever Mug. Among the finest made, you will be provided with great satisfaction and long lasting enjoyment. Why not pamper yourself or give a loved one a Golden Retriever gift to show them how much you care. 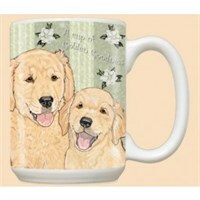 The Golden Retriever Mug will make the perfect gift for any Golden Retriever lover. Shop with confidence, because all products come with a 100% customer satisfaction guarantee. Click over now to see the big selection of Golden Retriever gifts we offer. 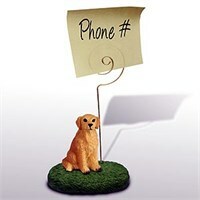 This magnificent Golden Retriever Note Holder will make sure that you never forget that important meeting. At approximately 6 x 2.5 inches our friendly Memo Holder will always stand out on your kitchen counter, desk or anywhere else you decide to place it. Or as a gift for a friend or loved one, this delightful Note Holder will always bring a smile. Perfectly divine, this darling dog will capture every heart in the room on this delightful Golden Retriever Paw Wipe Towel. Your beautiful hairy companion will astound on this 13 x 18.5 inch machine washable towel finely made from White Terry Cotton. It also comes with a Hook & Grommet for hanging anywhere in your home, car, boat or any place that you bring your best friend. 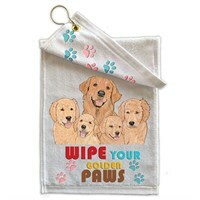 Our Golden Retriever Paw Wipe Towel is an adorable gift idea that friends will be excited to use for several years. 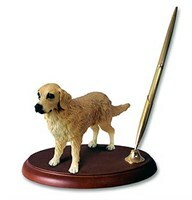 This spectacular Golden Retriever?á Pen Holder will spruce up any desk or work station. With a beautiful wood plaque mount, an intricately designed figurine and a handsome gold tone pen, your new desk accessory is sure to bring up lots of conversation about your favorite friend. The Pen Holder is always a fantastic gift.